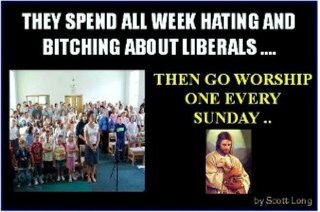 Yes Jerry Wayne-you are just like them as you criticize conservatives the same way and I don't know if you go to church. I bet it's not Perkinsville Baptist there near your home in Boone. Find something else that makes life unhappy for you. Take a bike ride or go walk on the Boone Greenway. Life's too short to be negative on politics constantly. The following was posted by Blogger, a person who wraps himself in religious piety over on the Watauga Conservative site. Lets see who can decode code the words in his post? He has given you a clue by posting a link to the most racist group of people in the most racist state in America. Bigotry and hate are Blogger"s tools of choice not ideas, nor solutions. This is the original post below. Sark wrote: "We have a no-load pot head for President. Thanks liberals. How about sitting the next one out." "If the MSM had vetted Obama, even you would have never voted for him." Vetting is the problem. We find out Obama is really a European Socialist as we suspected. Trump and Sheriff Arpio still believe by birth he is not eligible to run for president. They are still searching. 20 years under Jeremiah Wright should have indoctrinated him into Black Liberation Theology. In other words, if Libs won't vet him, others are, even while being labeled right wing kooks."